The expected response to fluid infusion is an increase of cardiac output (CO), and this response depends mostly on the current cardiac function of the patient. The importance of the prediction of fluid responsiveness (FR) is based on the fact that fluid loading in hemodynamic unstable patients may be hazardous and dangerous, e.g., by exposing them to the risk of developing pulmonary edema. The objective of this work is to improve the knowledge about the performance of the indices of FR prediction in association with different classification approaches in a particular setting, i.e., liver surgery. The specific aims are (1) the comparison of different CO estimators from invasive arterial blood pressure (ABP) measurement with particular attention to the assessment of CO variation after fluid administration and (2) the comparison of several indices for the prediction of FR to maneuvers classified from the CO measurements provided by a commercial monitor (PiCCO™, Pulsion Medical System, Munich, Germany). The main finding of this work is that pulse pressure variation (PPV) indices are more reliable and computationally feasible than stroke volume variation (SVV) indices. The PPV provided by PiCCO has the best performance in terms of area under curve, sensitivity, and specificity (0.92, 0.88, and 0.86, respectively), when the maneuvers are classified according to the maximum values of CO variation estimated during the second and third minutes after infusion. 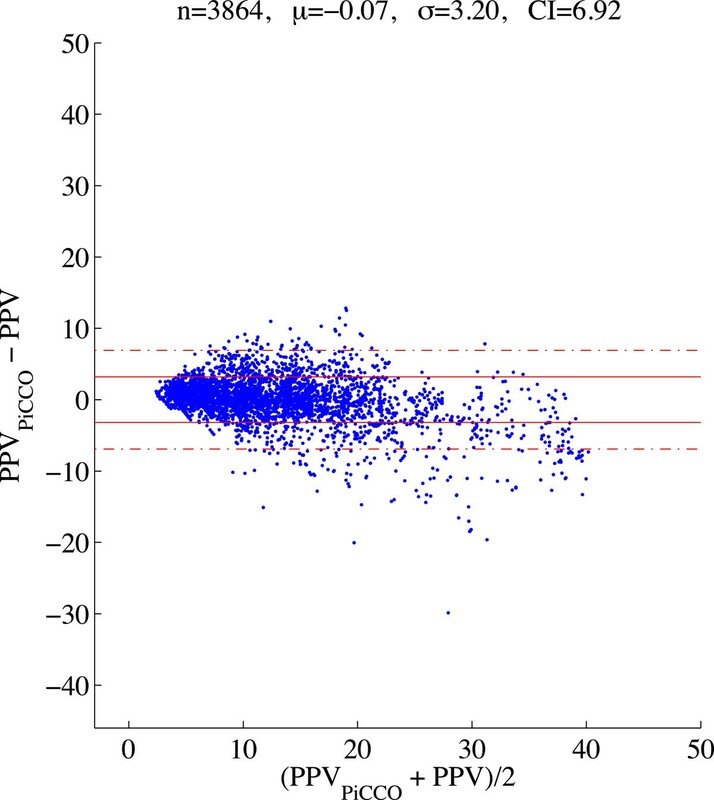 Moreover, PPVPiCCO is significantly correlated with the CO variation after infusion (rho = 0.51, p value < 0.05). The threshold values produced by the PPV indices (PPV = 13.9% and PPVPiCCO = 14.4%) are in agreement with the literature. From these observations, we conclude that the PPV index can be considered most suitable for the prediction of FR in liver surgery. Hemodynamic monitoring plays an important role in the management of patients in intensive care and during major surgery. Functional hemodynamic monitoring can be defined as the assessment of the dynamic interactions of hemodynamic variables in response to a defined perturbation . Clinical trials have shown the usefulness of functional hemodynamic monitoring for predicting volume responsiveness and identifying hidden cardiovascular insufficiency . Fluids are primarily administered to reverse hypovolemia and hypotension. Hypovolemia may be due to external fluid losses caused by bleeding or losses from the gastrointestinal or urinary tracts, or internal losses due to extravasation of blood or exudation of body fluids. Optimal fluid resuscitation remains a matter of lively debate; for instance, there is no consensus about which intravenous fluid solution is ideal, and no secure data support a preference for one over another . The end point of fluid resuscitation also remains unclear . In the context of fluid management, the routine administration of fluids to ensure patient hydration must be separated from the maneuver called fluid challenge (FC), which refers to the initial volume expansion period performed to carefully evaluate the response of the patient to fluid infusion . In particular, the importance of the prediction of fluid responsiveness (FR) relies on the fact that the fluid loading in such condition may be hazardous and dangerous for the patient, e.g., by causing or worsening pulmonary edema. Moreover, the fluid management of cirrhotic patients undergoing orthotopic liver transplantation (OLT) may be challenging and still remains controversial . The expected response to fluid infusion is an increase of cardiac output (CO) or stroke volume (SV), and this response depends mostly on the position of an individual patient on the cardiac function curve, i.e., the Frank-Starling curve . The Frank-Starling law of the heart states that the stroke volume of the heart increases in response to an increase in the volume of blood filling the heart, i.e., the end diastolic volume, when all other factors remain constant, but this initial steep increase becomes progressively flat until a plateau is reached; in this last case, a further increase in preload does not lead to any significant increase in SV. According to this concept, the maneuver of fluid bolus infusion can be classified as responsive when it is followed by a significant increase of CO or SV . The problem with this concept is that SV or CO is not a quantity that can be continuously measured. In fact, the available monitoring systems can provide a quantitative measure of cardiac output and stroke volume only at one time instant by the gold standard method of thermodilution, while the beat-to-beat variations of these quantities can be derived indirectly by other measurements such as arterial blood pressure. Many indices have been proposed to predict FR, which are considered related to the Frank-Starling curve and a sort of an estimation of curve slope, i.e., the so-called dynamic indices (pulse pressure variation (PPV), stroke volume variation (SVV), systolic pressure variation (SPV), and others) . However, these studies mainly concern ICU settings, septic, or postoperative patients [7, 8]. Very few studies have been performed in major surgery and in particular during liver surgery or OLT. Furthermore, these studies differ in terms of observational time window, type of fluid, velocity of administration, acquisition systems, and indices provided [5, 9–12]. All these factors can explain the controversial results. The originality of this work consists in the comparison between several approaches for the classification of the maneuvers and between indices provided by a commercial monitor and indices computed by algorithms described in literature. In fact, the majority of the works on FR indices take thresholds and criteria to identify responsive maneuver for granted [5, 9–12]. The objective of this work is to improve the knowledge about the performance of these indices in association to different classification approaches in a particular setting, i.e., liver surgery. The specific aims are (1) the comparison of different CO estimators from invasive ABP measurement with particular attention to the assessment of CO variation after fluid administration and (2) the comparison of several indices for the prediction of fluid responsiveness of maneuvers classified from the CO measurements provided by a commercial monitor (PiCCO™, Pulsion Medical Systems SE, Feldkirchen, Germany). The next sections will present the experimental protocol and the approaches adopted for the classification of the maneuvers, the comparisons among the different CO estimators and the values obtained from a commercial monitor, the correlation between CO variations and FR predictor indices, and the comparisons between the FR indices of responsive and nonresponsive maneuvers. Ten patients, who fulfill inclusion and exclusion criteria, were enrolled in this observational study at the University Hospital Tor Vergata in Rome, Italy. The study was approved by the local Ethics Committee of University Hospital Tor Vergata, and the patients gave their written informed consent to participate. Inclusion criteria were age above 18 years and prescription of OLT or hepatectomy. The exclusion criteria were persistent arrhythmias, arteriosclerosis, and tidal volume less than 8 ml/kg of ideal weight . OLTs were all performed by using piggyback technique, i.e., a venous anastomosis and not a venous-venous bypass. Sedation was induced using propofol and/or sufentanil (2 mg/kg) and maintained by total intravenous anesthesia (TIVA, 6 to 8 mg/kg/h). Rapid infusions only were analyzed, and they consisted boluses of 100 or 500 ml administered within 30 s or 1 min, respectively. The administered fluid consists mainly of blood recovered by the patient with addition of crystalloid and colloids; such solution is named ‘reservoir’. The fluid was infused by a peristaltic pump (Belmont FMS 2000™, Boston Road Billerica, MA, USA). Each patient was instrumented with an arterial catheter inserted in the brachial artery and placed in the aortic arch, with a central venous catheter inserted in a jugular vein and with an ECG lead. All the patients were monitored by Pulsion PiCCO and GE S/5 Avance Carestation devices. The following signals were continuously recorded during the entire surgery: arterial blood pressure (ABP), air flow (AF), air pressure (AP), central venous pressure (CVP), pulse contour cardiac output (PCCO), and SV. ABP and CVP were recorded at a sample frequency of 100 Hz, AF and AP at 25 Hz, and ECG at 300 Hz. Cardiac output (CO) and all indices provided by Pulsion PiCCO were provided with a sampling frequency of 2.5 Hz. For each maneuver, the time windows were selected beginning 20 s before the start of infusion and including the following 3 min. Preprocessing of raw recordings of ABP, ECG, CVP, and respiration (AF and AP) was performed in order to extract beat-by-beat series, employing standard and robust algorithms. In particular, R peaks indicative of each cardiac cycle were extracted through ECG processing, hence constructing RR interval series (RRI); beat-by-beat series of systolic blood pressure (SBP), diastolic blood pressure (DBP), mean arterial pressure (MAP), and pulse pressure (PP), computed as the difference between SBP of the current cardiac cycle and DBP of the previous cycle, were extracted from the arterial pressure waveform ; beat-by-beat CVP was calculated as the mean value of continuously recorded CVP over each cardiac cycle, defined as the interval between two consecutive R peaks. The respiratory cycles were identified from the AF signal by applying a threshold to a series obtained from the cross-correlation between the AF signal and a stepwise weight function. The tidal volume Vt was estimated as the area of AF signal between the beginning and the end of a respiratory cycle. Two algorithms were implemented to extract beat-to-beat values of CO and SV from the continuous ABP signal: the Liljestrand and Zander method (COLM, SVLM) and the systolic area method (COSA, SVSA). For mathematical details, see . where COref is the average of CO values measured during the last 20 s before the start of infusion. CO variation was assessed by using the values obtained from the implemented algorithms and the values provided by PiCCO. The PiCCO is a commercial monitor that can provide both a quantitative measure of CO by means of thermodilution and a continuous estimation of CO. The monitor estimates CO from the peripheral ABP measurement by applying the pulse contour analysis, i.e., a sort of weighted systolic area. Notice that CO variation is equal to cardiac index (CI) variation as the normalizing term of body surface area is canceled. where SVmax and SVmin refer to the maximum and minimum values, respectively, obtained in a single respiratory cycle. The same indices provided by PiCCO monitor were recorded as well (PPVPiCCO and SVVPiCCO), for comparison purposes. Notice that the PiCCO monitor computed these indices without the information on respiratory cycle, but by considering moving windows of 30 s.
SPV was computed too as the difference between the maximum and minimum values of SBP obtained in a single respiratory cycle. The average values of these fluid responsiveness indices were computed in the time interval of 60 s before the fluid administration started. in each time window, the maximum value and the 75° percentile of Δ COPCCO were estimated. The last case was considered to limit the effects of artifacts or short transitory increase in CO, but not effective. In all cases, a maneuver was classified as responsive if the CO variation estimated according to that approach was higher than 10%. The CO variations (Δ CO) obtained from different estimators and on different time intervals or statistics were compared, and a Pearson correlation analysis was performed. The fluid responsiveness indices estimated were compared with the FR indices provided by the commercial monitor PiCCO by the Bland-Altman analysis. After the subdivision of the maneuvers into two groups, i.e., responsive and not responsive, receiver operating characteristic (ROC) curves were estimated to obtain threshold values for each index. The index values were compared between the groups by means of Wilcoxon-Mann–Whitney test. Table 1 illustrates the characteristics of the population. Ten different surgical interventions were analyzed (eight hepatectomies and two OLTs), for a total of 25 maneuvers. The most frequent motivation of the surgery was neoplasia (seven out of ten). F, female; M, male; H, hepatectomy (hepatic resection); OLT, orthotopic liver transplantation. Table 2 shows the correlation coefficients obtained by considering the CO variations estimated with the proposed methods and the CO variations calculated with the values provided by the monitor PiCCO. The higher significant coefficients were obtained for the second time window and for the Liljestrand and Zander method. Figure 1 shows the CO variation values for all the maneuvers considered in this study and for all the methods considered. Notice that the values are distributed mainly on the bisectrix, and the values are coherent with the ones from PiCCO as the values are in the same quadrant. The figure shows the values of CO variations estimated with the two estimators. The figure shows the values of CO variations estimated with the two estimators (panel A: Liljestrand and Zander method; panel B: systolic area method). The coefficients were calculated between the values of CO variations estimated with the two methods and the variations estimated with the CO values provided by the monitor PiCCO. Fist window: 1 min after infusion; Second window: 2 minutes following the first window. *Pearson correlation p value < 0.05. The indices of fluid responsiveness were compared by the Bland-Altman analysis. As Figure 2 shows, the PPV values obtained from the monitor PiCCO showed a high agreement with the ones estimated according with the definition, i.e., by using the respiratory signal. The average value of the difference is close to zero, and the standard deviation of the difference is less than 5%. A different result was obtained with SVV indices: SVVSA values were very similar to SVVPiCCO for lower values, while for higher values, SVVSA overestimated the values of the monitor. SVVLM showed higher differences with respect to SVVPiCCO and overestimated for low values; the average difference was 6.15%. The figure shows the values from Bland-Altman analysis of the PiCCO. The figure shows the values from Bland-Altman analysis of the PPV values provided by PiCCO. The correlation coefficients between the fluid responsiveness indices and the CO variations estimated from the PiCCO values are illustrated in Table 3. 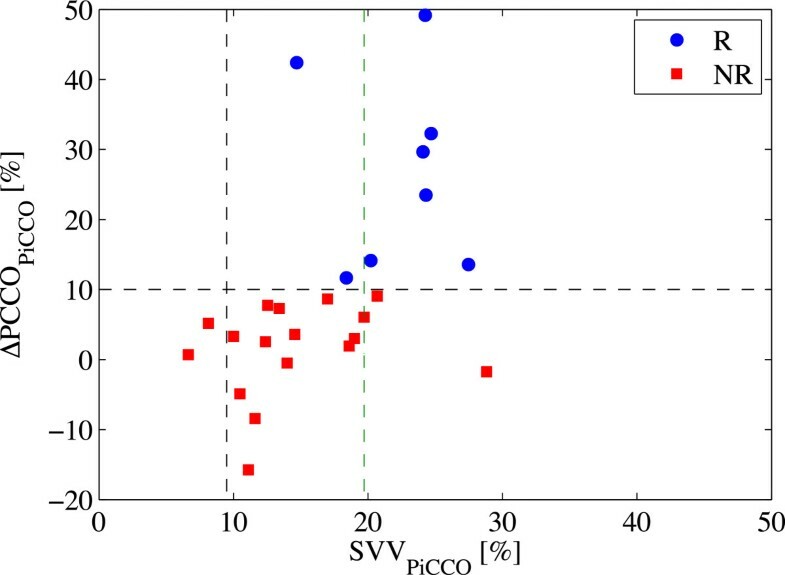 The highest significant correlations were obtained by the PPV and SVV indices provided by the PiCCO monitor. Interestingly, none of the indices were correlated with the CO variation estimated in the first time window, i.e., during the first minute after infusion. The coefficients were calculated between the FR indices values estimated before fluid infusion and the variation computed from the CO values provided by the monitor PiCCO after the infusion in three different time windows.1st window: one minute after infusion; 2nd window: two minutes following the first window. * Pearson correlation p-value < 0.05. Finally, the maneuvers were classified as responsive and non-responsive according the CO variation estimated as previously described. The CO variation estimated in the first time window, i.e., after the first minute following infusion, was excluded as none of the FR indices correlated to Δ PCCO. The maneuvers classified according to the maximum values of Δ PCCO estimated during the second time window obtained the best performance in terms of sensitivity and specificity. Table 4 shows the area under curve (AUC) and the threshold values obtained from the ROC curve. In particular, PPVPiCCO showed the best performance in terms of AUC, sensitivity, and specificity. Threshold, sensitivity, specificity, and AUC values are estimated from the ROC curve. These values refer to the maneuvers classified according to the maximum value of CO variation registered in the second time window. However, the PPV threshold (14%) values were slightly higher than the values reported in the literature. A larger difference was instead obtained for the SVV index whose threshold was twice the ones reported in the literature and very different among the SVV estimators considered in this study (see Table 4 and Figure 3). Values of SVV indices and CO variations. Values of SVV estimated by PiCCO before the rapid infusion and values of maximum variation of cardiac output (Δ PCCO) obtained during the second time window. The dashed horizontal line marks the threshold, which separates the responsive (R) from nonresponsive (NR) maneuvers. The dashed black vertical line marks the threshold commonly used in the literature (9.5%) for SVV index in order to predict the outcome . The green line marks the threshold obtained in the present work. This work showed how CO estimated from invasive ABP measurement by different algorithms provided similar performances for the assessment of CO variation after fluid administration. This analysis was not focused on the validation of CO absolute values obtained from the application of different algorithms existing in the literature, but rather to verify the possibility to use such standard methods, in the absence of thermodilution calibration. Also, the estimates of cardiac output provided by commercial monitor systems are not continuous and often, but not always, require calibration; they are ultimately determined by algorithms that are covered by patents, making it hard to evaluate the goodness with respect to other analyses, such as the ones performed offline in this work. As regards the comparison among the indices for the prediction of fluid responsiveness, the Bland-Altman analysis showed a good agreement between the PPV values estimated according to the definition, i.e., by using the respiratory signal, and the PPV values provided by the monitor PiCCO™ (Pulsion). The SVV indices showed instead a worse agreement with the SVVPiCCO values. Finally, this work investigated several approaches in order to classify the maneuvers into responsive and nonresponsive to evaluate their performance in liver surgery. The maneuvers were classified as responsive by using the values provided by the commercial monitor (PiCCO™, Pulsion) commonly adopted in operating rooms (COPCCO) and by adopting different criteria, i.e., the time of response and the statistics for CO variation values. PPVPiCCO showed the best performance in terms of AUC, sensitivity, and specificity when the maneuvers were classified according to the criterion of maximum CO variation during the 2 minutes following 1 minute after fluid infusion. Moreover, the threshold value obtained from the ROC curve was 14% similar to those reported in the literature on ICU setting for septic patients (13%)  or cardiac surgery (12%) . SVV indices showed good performance too; however, the threshold values were different among the estimators (Table 4) and much higher than those reported in literature . In the work of Biais et al. , the FR maneuvers were analyzed in patients undergoing OLT, and the SVV threshold values observed in association with the best classification performance were 9% for the SVV index estimated by a Doppler echography and 10% for the SVV index estimated by FlocTrac (Edward Lifescience, Irvine, CA). However, such differences can be explained by the different protocol: it has not been specified the time interval before fluid infusion and the volume expansion maneuver took 20 min. Our results suggested that PPV indices are more reliable and computationally feasible than SVV indices. This can be easily explained by the fact that the former ones are estimated from a direct measure, i.e., from ABP signal; the latter ones are assessed in turn from an estimated quantity, i.e., the stroke volume assessed from ABP signal. This further exposes the index to the potential limitations, which should be carefully considered when relying on estimates from monitors. The value of this work consists in the approaches proposed for the classification of the maneuvers and the thorough analyses of the FR indices both provided by a commercial monitor and computed by algorithms well known in the literature. This solution represents a novelty and can pave the way for further analyses in order to standardize and validate the criteria proposed. Moreover, the commercial monitor provides only the values of the indices, and the variations are often visually observed by the clinicians. This could be a source of errors or, at the very least, a limitation of the effectiveness of monitor-derived estimates. The offline investigation represents a limitation, but it is the first step for the implementation of new monitoring procedures, e.g., monitoring systems for the fluid management, which can control the fluid infusion and monitor the patient response automatically . The main finding of this work is that PPV indices are more reliable and computationally feasible than SVV indices, and PPVPiCCO has the best performance in terms of AUC, sensitivity, and specificity when the maneuvers were classified according to the maximum values of Δ PCCO estimated during the second time window. The threshold values produced by the PPV indices were similar between the ones provided by the commercial monitor and the computed index, in further agreement with the literature. From these observations, PPV index seems more suitable for FR prediction in liver surgery. This work was supported by the Italian Ministry of Education, University and Research (MIUR, FIRB2008, Project# RBFR08VABD). We would like to thank the personnel of the Policlinico “Tor Vergata” for their commitment and dedication to the successful conduction of this study. FC, MD, and NT initiated and designed the study. AC, FC, and MD collected the data. MF, SP, FA, and GB analyzed and interpreted the data. MF, FA, SP, and GB contributed to the writing of the manuscript. AC, FC, MG, MD, and GB gave scientific advice in their field of expertise. All authors revised the manuscript and approved and contributed to its improvement.